Tumbler engraved hops and barley with the distinctive 'Lynn' moulding C1760-70. Note: The prominent feature of Lynn glass is the presence of shallow horizontal grooves in the body of the vessel. Engraved Lynn tumblers are rarely seen. 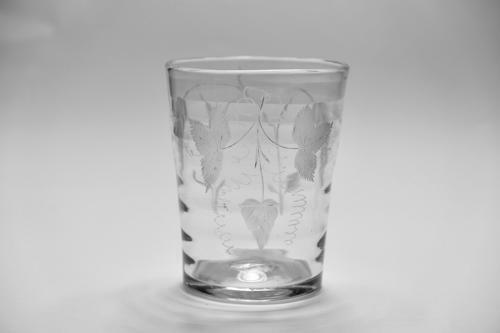 For a similar example see Lynn Glass 'Glass of the 18th Century traditionally associated with King's Lynn or Norwich' by Delomonse & Son Ltd 1995. p.17. plate 10a.